Obviously, the answer is because his parents are mean. Or crazy. Or both. At least, I suspect it looks a bit like this. The real reason is that we think Simon wants to quit for the wrong reasons, and we’re not going to let him until or unless we’re all miserable for another month or two. Simon really likes drumming. We started with the lessons in the first place because it was something he liked playing at. And at the beginning, it was great. His very kind teacher Mr. Shirley would show him something, and Simon would do it. Then he’s show him something new, and Simon would do that, too. It was eeeeeeaaaaasy. Then it got trickier, and Simon couldn’t replicate everything the first time he tried. He had to actually, you know, try a few (or a bunch of) times before mastering a new beat. But while Frank proudly sang “Mistakes, I’ve made a few…” and seemed not at all bothered by it, Simon equates mistakes with failure and embarrassment. Which means the first time he’d be introduced to a new rhythm or beat, he’d either freeze from panic and say “I can’t do that” or collapse into snotty sobs if he didn’t succeed on the first try. Sometimes he’d do both. You cannot imagine the number of lectures Matt and I have given on the importance of mistakes. How if you aren’t making mistakes, you aren’t trying. How if you are learning something new, it’s not even a mistake yet! How if he’s not making mistakes, then Mr. Shirley has nothing to do. We’ve told him all of that. Over, and over, and over again.We even had Simon teach me for a while, so he could see an adult make a mistake and move on. Sometimes we’d pull it off. Other times Simon would develop mysterious stomach ailments right before drum classes that magically disappeared if we canceled. Matt and I were honestly ready to throw in the towel about two weeks ago for all the reasons you are no doubt thinking to yourself right now. “He’s only six. This is supposed to be fun. If it’s making him sick, stop and try again later.” Yup we thought all those things, too. Then a funny thing happened on the way to cancellation. Simon started drumming with his hands all the time. On the dining room table, on the couch, at a restaurant, everywhere. He’d listen for beats in music and drum along in the car. It became increasingly clear to me that Simon liked drumming, just not drumming lessons. 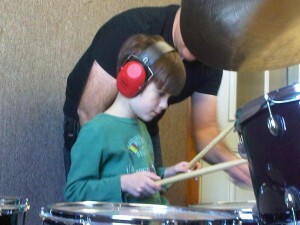 Or more specifically, just not the part in drumming lessons where he might make a mistake. We may yet have to take a break because of this perfectionism, but we were not going to let a child who enjoys drumming stop taking drum lessons without a fight. Not with a child for whom perfectionism is a problem, and not with a child for whom frustration when things get difficult is a challenge. And especially not after last week’s parent-teacher conference, when Mr. Sowder suggested I not let Simon give up when the going gets hard. He needs to learn to cope with mistakes and persevere when things get hard. And if he can start working on these challenges now, he’ll be that much further along when the stakes get higher down the road. Happily, last week’s lesson was terrific. Matt tipped off the teacher, and he took a different approach to the lesson. Simon got to pick some beats of his own choosing, he played almost exclusively on the kit instead of on practice pads, and together he and the teacher came up with sentences or words to match specific beats. I’m hoping that this week’s lesson is going much the same. If it is, Mr. Sowder will thanking me next week. And Simon? Well, he can thank me in about 14 years when he understands why his dad and I pushed him so. Good for you. He HAS to learn to make mistakes, and that it’s okay. He HAS to learn to fail and pick himself up again. You and I have seen too many kids in college for whom everything was given or easy, and how they can’t handle it when they get to college and all of a sudden they don’t do so well.